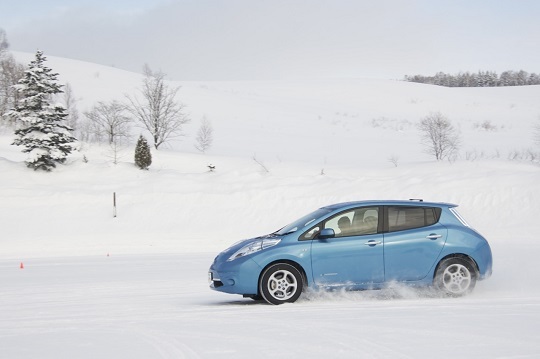 Last week while relating the winter driving experience of the Nissan Leaf, I spent a lot of time discussing the way temperature impacts the range of the car, and two ways that the Leaf displays how much ground you can cover on the battery's charge. There are a couple other ways you can track the Leaf's energy consumption that I'll get into here, as well as a few other lingering techie frills that I haven't covered, yet. I'll wrap up with an analysis of the maintenance that a Leaf needs, or rather the lack of maintenance. Basically, EVs don't need to deal with the extreme heat and friction that's generated from the rapid series of controlled explosions in an ICE (internal combustion engine). They don't need oil because there is so little friction in an electric motor. That's a little hard for some people to wrap their head around. There is no oil because there is no engine with super-hot pistons that need to be lubricated to prevent them from seizing up. EVs sidestep that whole pit of design constraints, resulting in a system that needs much less maintenance. But before I get to far into that, let's talk about energy. With a relatively short range that can be as low as 50 miles in severe weather, keeping track of energy consumption is of critical importance in the Leaf. I've already talked about the GOM and the charge level meter as the two main ways that you can gauge how far you can go before you run out of juice. 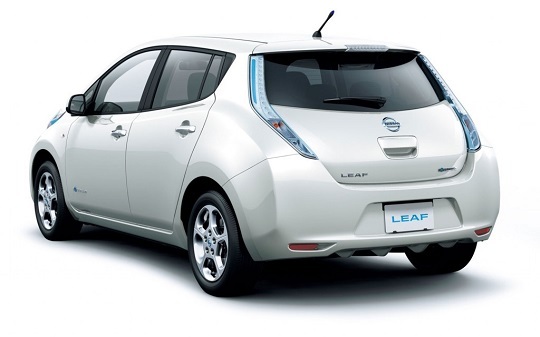 The Leaf also keeps track of how many miles per kWh you've driven on average. You can show this measurement on a monochrome LCD display that you can see right through the steering wheel, and it gives you the lifetime average for the car as well as a horizontal graph of the instantaneous value in the range of 0 to 8 miles/kWh. The average readout started off at 4.1 miles/kWh in January of 2012, if I remember correctly; crept up to 4.8 miles/kWh during last summer; and then leveled off at 4.5 miles/kWh by Christmas, where it has stayed ever since. I would imagine people further south would get substantially better averages because it doesn't get cut down by cold weather. You can also see the average and instantaneous energy consumption on the color touchscreen display on the center console. I have to say, this touchscreen is really nice. I've used a couple other touchscreens in the Prius and the Ford C-Max, and those both suffer from some pretty small button touch areas. I would have to steady my my hand with some of my fingers resting on the edge of the display to use those screens, but not so with the Leaf's touchscreen. It has nice big button areas on all of the common screens that are easy to jab at while driving. I can easily hit any selection I need to, even when wearing gloves in the winter. Getting back to the energy consumption display, the instantaneous readout is a vertical bar graph here, and unlike the monochrome display, the average can be cleared whenever you want to start a new averaging period. Each time you clear the average, it records the cleared value in a history bar graph so you can track how your energy consumption changes over time. I clear the average at the beginning of each month, and from the history graph I found that my monthly average energy consumption varies from a low of 4.0 miles/kWh in the dead of winter to a high of 5.1 miles/kWh in the summer. If you figure in the 24 kWh battery, I should get a 96 mile range in the winter, but that 4.0 miles/kWh is a monthly average, and the battery isn't really a 24 kWh battery in the winter because cold temperatures reduce its maximum capacity. I suspect this measurement is a bit optimistic, too. According to it, I should have a range of about 122 miles in the summer, but I definitely do not. Maybe the useable capacity of the battery is more like 20 kWh, which would correlate much better with the 100-mile summer range I routinely see. If only I could always drive at 5.1 miles/kWh, right? Another way to see the current energy consumption is with a set of radial gauges on another screen on the color display. This screen breaks out the energy consumption into the electric motor, the climate control, and all other accessories. The motor gauge has a section that goes negative for when the regenerative braking is recovering charge, and it's also the largest gauge with the largest range, of course. You can recover up to 30 kW when braking hard and burn up to 80 kW when accelerating hard. It's pretty easy to peg that gauge in either direction, but to really conserve energy, you obviously want to keep it as low as possible at all times. The climate control gauge shows that it can consume up to 6 kW, but I've never seen it go that high. However, I don't spend a lot of time on this screen, so who knows. It could get there in the winter with the fan on high and all of the heated seats and steering wheel on high. Maybe I'll try it this winter. I did notice today, when I was experimenting a bit, that if you have the A/C on in ECO mode, switching to Drive mode gives the A/C quite a boost. It cools the cabin down significantly faster, but it more than doubles the energy consumption. If you can afford the energy, the A/C boost really works well. It's nice to have the choice. The gauge for the rest of the system only has a range of 2 kW, and it has a baseline consumption of about 0.15 kW. The audio system barely registers on this gauge, even if I crank the radio much louder than I care to listen to it. The only think I've seen affect this gauge much is the headlights. Even though they're LED headlights, they add about 0.15 kW and the brights add another 0.15 kW for a grand total that's just under 0.5 kW. That's negligible compared to the electric motor consumption. Since the motor is the largest factor in energy usage by far and I can monitor its impact on other screens, I mostly ignore this screen. The 'Status' screen showing the current song playing along with smaller versions of the average and instantaneous energy consumption readouts is the one I use the most. If that's not enough ways to measure the Leaf's range, here's another one. There's a button on the steering wheel with a blue circle and a dot in the middle that you can push to bring up a road map on the color display. The map shows your current location with a white circle marking the extent of the Leaf's range and a concentric grey circle marking the extreme limit of its range in ECO mode. These are, of course, the Leaf's GOM estimate translated into the circles' radii, but it is nice to see it visually on a map. The map also shows electric plug icons wherever there is a charging station, and the station information can be updated at any time with a few menu selections. You can download new stations for where you are right now, where your home location is, or where the map is showing. If you're running low on charge, you can calculate a route to one of the stations closest to you. You can also sort the stations by those closest to the destination set in the navigation system or the center of the map, so you can easily plan for your charging needs. Already in Madison, you're never more than a couple miles from a level 2 charging station, and the charging infrastructure is expanding rapidly. With the Leaf's navigation system, you never have to worry about running out of charge in any city that's well stocked with stations. You'll always have options, and you'll know exactly where they are. 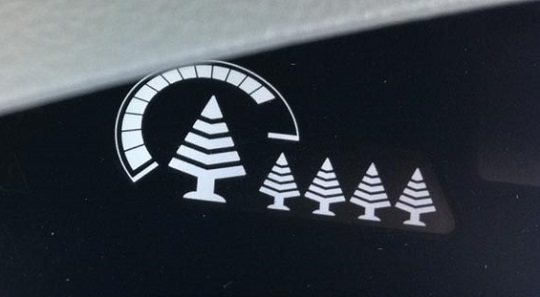 I completely grew five trees on my 72 mile drive back from the dealership when I bought the Leaf. The peak of the last tree popped up right as I was pulling into the driveway. Even though the route was not especially kind to my range and I was forced to drive less efficiently than I wanted to, the distance alone must have been enough to allow all five trees to grow. Since then I have rarely grown a full tree regardless of the fact that my commute to work is much better for energy usage. The route is too short and the history clears every time you turn off the car, so I don't get a chance to build up any trees. The only other times I've completed a tree are when I'm stuck in a lot of traffic on the beltline so that I'm creeping along at 5 mph for 10 miles, or when I bail and drive through the city, which ends up being twice as many miles of stop-and-go traffic. In neither of those cases does it seem like I've saved energy. In fact, I most definitely wasted energy because those are the days that I end up with less charge left when I get home. But I grow full trees those days. Go figure. You also have the option of having the car upload your completed trees to a database and competing on a leader-board for most efficient Leaf driver. You've probably already guessed that I don't see much point in doing this, and I find the whole tree-growing efficiency measurement a bit dubious. If I wanted to game the system, I could, but I have better things to do with my time. Besides, the car is so much fun to drive, and I'd rather enjoy it. I get good energy economy out of it anyway. I know that a lot of cars have this feature now, but the Leaf was the first car I've driven with it so I have to rave about it a bit. Keyless entry/start is the best invention since cruise control. Seriously. I never have to take the key out of my pocket. It's not even a key and a fob anymore. There's a pseudo-key in the fob that can be used in an emergency if the fob isn't working, but otherwise the fob sits at the bottom of my jeans pocket. There's a button on both the front driver and passenger door handles that you can push once to unlock that door or twice to unlock all doors. Push the button on your way out of the car to lock all of the doors. The hatch unlocks when you push a button under its handle. The doors will only unlock when the car senses the fob is within an arm's length of the door handle. This is so much better than fumbling for the fob with your arms full of groceries or small children. Once you're in the car, you just plop down and push the power button - no contortions to extricate your keys because you forgot to get them out of your pocket before sitting down, no fiddling with the steering wheel and jiggling the key in the ignition because it won't turn, and no keys dangling from the steering wheel and whacking you in the knee while you drive. After getting the Leaf, I got used to this feature so fast that I forgot my keys in my pocket every time I sat down in our Corolla. What a relief it was when we replaced the Corolla with a Prius with keyless entry/start! You have no idea how much you hate using a key until you don't have to anymore. Maintenance? It don't need no stinkin' maintenance. It's comical to think about the maintenance that does not have to be done to this car. After a year and a half, I've been to the dealership three times for maintenance. The first two times were for the 6-month and 12-month battery inspections. These are paid for and required by Nissan to make sure the battery is performing optimally in the first year, and it should continue to be checked once a year after that to maintain the battery warranty. At the 12-month battery inspection they also did a 5-point inspection for the brake lines, brake pads, charging port, drive shaft boots, and reduction gear oil. The third time I went in for service, it was for a software upgrade, and while I was there, I decided I might as well have the tires rotated. I could have done it myself, but it was only 20 bucks and it would save me an hour. The software upgrade was a two part upgrade. The on-board charger was upgraded to interface with more types of charging stations, and the battery charge level measurement systems were upgraded to include the improvements that were made to the 2013 Leaf. Now that's a nice gesture from Nissan. They're giving all of their 2011 and 2012 customers a free software upgrade so we can benefit from the improvements they've made to the 2013 Leaf. Granted, I don't get the improved regenerative braking, but that's a more significant hardware upgrade. I'm happy they're supporting the loyal early adopters wherever it's reasonable. The upgrade made noticeable improvements, too. The GOM isn't nearly so jumpy anymore. It used to be overly sensitive to variations in driving conditions, like changes in acceleration getting on and off the freeway or when driving up and down hills, especially when there was a lot of charge left. Small variations in energy usage extrapolated over a large amount of charge resulted in the GOM dropping or adding 5-10 miles at predictable points during my commute. My best guess is that they're using an exponential averaging function with a smoothing factor that was too large, and the upgrade corrected that, making the GOM less sensitive. There were likely other optimizations as well, and it made a big difference in the apparent accuracy. It also seems like the charge level meter is more linear. It used to be that the charge level would stay on certain bars for a relatively long time and then drop two bars in a correspondingly short time without any changes in driving conditions. Now the meter seems to drop bars at a much more consistent rate. I'm not completely sure on this observation, though. I never took accurate measurements of its behavior, and it could all be in my head. Okay, back to maintenance. Basically, I have to take the Leaf in once a year for a battery check and a multi-point inspection. Every 30,000 miles the brake fluid should be replaced, but I'm not sure why because the ERB does a lot of the braking. At some point the brakes will have to be done, but I'm not sure I'll still have this car at 200,000 miles. That's when I figure they might need to be replaced, but I'm really not sure. It could be longer. Assuming it's 200,000 miles, at the rate I'm driving, I would reach that sometime in the year 2045. I'm likely to have a new car by then. Instead, the EV has an electric motor, replaces the transmission with a single reduction gear, and has some serious electronics: the charger, battery, and inverter. It ends up being a much simpler system with substantially less points of failure. Also, there's a lot less mechanical wear-and-tear and heat generation going on in an EV so maintenance is practically non-existent. There is one major point of failure that a lot of people worry about, though - that ginormous battery. It's expensive, too. An estimate from 2010 put it at $18,000, which is half the price of the entire car, but it has certainly come down from that as production increases and manufacturing improvements are made. The price of a 2013 Leaf is almost $4,000 less than the same 2012 Leaf, and it has quite a few improvements that come with it. I'll bet most of that price drop was from reduced battery costs. 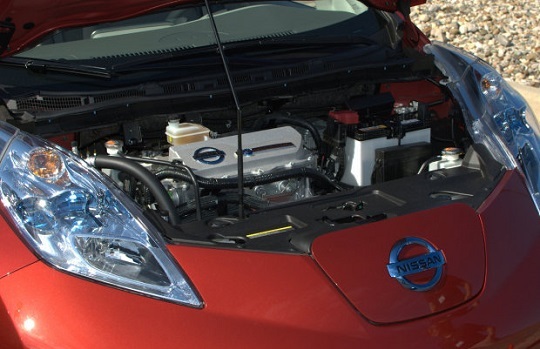 As a point of comparison, Nissan recently announced a battery leasing program where you can get a replacement battery for $100/month, and the program guarantees at least 70% capacity on that battery for the entire life of the car. If you assume, for the sake of argument, that the $100/month is paying off a new battery at a cost of $18,000 (with zero interest), it would take 15 years to pay it off. That's not even taking into account the replacement cells you could get during the program to maintain 70% capacity. I would bet that Nissan is really estimating a 5-year payoff, which would equate to $6,000 for the replacement battery. It's pretty clear that batteries will get a whole lot cheaper in the coming years, or Nissan wouldn't be offering a program like that. At the same time, these batteries are much more reliable that a lot of people think. As I mentioned a couple weeks ago, Nissan is guaranteeing their batteries to a 70% charge capacity for 6 years/60,000 miles. They are pretty confident that most of the batteries out there in Leafs are going to last at least that long. If you actually do have to replace the battery after 6 years, it will likely be much cheaper. How much cheaper? I don't think anyone can really say, but you could always enter the battery leasing program at that point for $100/month. I don't think the program will still cost that much by the time most people would need it, though. And most people aren't going to need it for quite a long time. I know I won't. Even if my battery is near 70% capacity in 5 years, that will be enough to get me to and from work twice on a charge in the summer, and more than enough for one commute in the winter. But I seriously doubt the capacity loss will be that bad. Next week I'll have a better idea of how much capacity I've lost over the last year and a half, and thus, what I can expect for the years to come. I've kept track of the mileage I've driven for every charge, and I plan to try to make some sense of it for my next post. It should be interesting. When I lost my job in late 2011, I suddenly found myself in the market for a new car. Now that may sound strange, but I used to be able to walk to work because the office was less than a mile away from my house. The office for the new job I landed was a bit over eleven miles away, so I wasn't about to continue my daily walks to work, especially in the winter. Because I used to always walk to work, my family was able to survive with one car quite comfortably. Now we needed a second one. I was intent on getting as fuel efficient a car as I could that would still comfortably seat four people - two of them in car seats - for the times that we wanted to use it instead of our aging Corolla. I briefly looked at the Mazda3. A fun, nice looking car, but 40 mpg wasn't going to be good enough. I also considered the Prius, but I wasn't impressed with how they had started cutting corners on the high-tech feel of the car. Among other things, they had replaced the color display of the car's fuel efficiency information with a monochrome display next to the speedometer. Toyota has recently revamped the Prius, bringing back the color display as a touch screen, and we did eventually trade in our Corolla for a Prius in June of 2013. But at that time I wasn't too excited about it. While researching the new car market, I learned that the Nissan Leaf was the first fully-electric car available that didn't cost a fortune. It was still pretty pricey, but with the government rebate, it was affordable. The Leaf could go about 100 miles on a charge, which was more than enough for me to get to work and back a couple times. I didn't need a car that would go long distances because it would be our second car. I was intrigued. There was one problem. The Leaf was not being sold in Wisconsin, yet. The 2011 and 2012 model years had a limited roll-out because Nissan was making sure that states had adequate charging infrastructure in place before making the car available for sale. They weren't going to take orders on Leafs in Wisconsin until March or April of 2012, and first deliveries would arrive in June or July. I needed a car in early January. Even though I wasn't sure that I could get one, I decided to take a trip down to Chicago to try one out anyway, and see what I thought. I was blown away by the test drive. The Leaf was everything I wanted in a car. It was quick, quiet, and full of high-tech goodness. Even better, it was actually roomier than our Corolla, except for maybe the trunk. Even though the Leaf is a hatchback, it's hard to beat the Corolla's trunk. It is just freaking huge for a car that size. Anyway, I wanted the Leaf. Now I had to figure out a way to get one and get it back to Madison. That may not seem like it should be that difficult, but it would have been if not for a lucky break. First off, the car's limited range severely limited the number of dealerships within range of my house, namely one in Rockford, Il. For the dealerships around Chicago I would have had to get the Leaf to Milwaukee and charge it before I could get it back to Madison. Even that would have been a stretch because it was the middle of winter, and the Leaf's range is reduced in cold temperatures. There was the option of having the car delivered, but I didn't want to resort to that because it was pretty expensive. Getting the car home wasn't the worst of my problems, though. The real problem turned out to be buying the car. I had assumed that I could go to any dealership in Illinois and buy a Leaf, but that was wishful thinking. Nissan was only taking Leaf orders through their website, not from dealerships. Every car was built-to-order and shipped to the desired dealership with a three month lead time. The lead time was trouble enough because I needed a new car quickly, but it turned out that Nissan wouldn't even take your order if your address was not within the designated states where they were selling. I tried calling a number of dealerships in northern Illinois to see if anyone could help me buy a Leaf. No one had any immediate options that were viable. They couldn't even sell the demo Leafs off their lots because Nissan wouldn't allow it. This all struck me as a rather strange predicament. Here I was trying to buy a car off of any dealership that could get it for me, and I would be paying MSRP because Nissan was selling them at a fixed price. It was an easy, guaranteed sale. I'm sure any dealership would have loved to sell me the car, but they couldn't because I lived 50 miles north of the Illinois border! I got a phone call a couple days later with some great news. The dealership closest to me had received a cancellation because the customer needed a new car and couldn't wait for their Leaf to arrive. The Leaf was already in transit to the dealership, so the order couldn't be cancelled from the factory. It was arriving on the lot on Friday, and I could have it if I wanted it. Now, it wasn't exactly what I wanted. It was an SL, which added a solar panel of dubious value and a quick charge port that I was certain I would never use, and it was silver instead of blue. I decided not to look a gift horse in the mouth and said I'd be there on Saturday to pick it up. Come Saturday my wife and I piled the kids in the Corolla and we all drove down to Rockford, Illinois to get Daddy's new toy. It was an especially warm January 7th, with a high of 60℉, which was a good thing because to get me home the Leaf was going to need all the help it could get. When we arrived at the dealership, the salesman apologetically told me that they somehow dropped the ball, and the Leaf had not been charged the night before. What?! But not to worry, they'd been charging it since he got in that morning. Again, what?! The Leaf kinda needs to be charged to go anywhere, and it takes 7-8 hours to fully charge. How do you mess that up? I wasn't about to push it back to Madison. It looked like we would be staying a while. That turn of events gave us plenty of time to go through all of the paperwork and the Leaf tutorial and what not. We also had a nice look at all of the other Nissans in their showroom. The kids particularly liked hanging out in the 370Z Roadster they had. Nice car. By the time the Leaf was charged, detailed, and ready to go, we were more than ready, too. The kids were beyond squirrely by then, and I think the sales staff was glad to see us go. The Leaf helpfully reported that it could travel 96 miles in ECO mode, and it was only 72 miles to Madison according to the navigation and avoiding freeways. I thought 24 miles to spare should be plenty of margin. My wife would follow in the Corolla, and my daughter really wanted to ride with me in the new car. Fair enough. It was late afternoon, and we had to get a move on while it was still warm, so off we went. I learned an awful lot about the Leaf in those first few dozen miles of driving. For instance, it's not too efficient with a combination of 55mph highways and stoplights. Pretty much the whole route to the Illinois border was like that, and I must have hit every perfectly-timed stoplight. I did my best to accelerate slowly and coast into the stops so that the regenerative braking could recover as much charge as possible, but it's quite a lot to ask the braking to make up for that kind of extreme constantly varying speed. By the time we crossed into Wisconsin, I was down to about 16 miles of margin and I'd only gone about 18 miles. The stoplights ended at the border, but then the hills began. From the Leaf's perspective, hills look almost like stoplights. It recovers some charge going downhill, but not as much as it consumes powering uphill. I was watching the navigation system and calculating options in my head almost constantly, but there really was only one route to take for most of the trip. When we were within 15 miles of home, I actually only had 5 miles of margin to work with, and the temperature was dropping as the sun went down. My hands were going numb, and I seriously regretted leaving my coat in the Corolla. The weather had been nice and warm when we left the dealership, so I thought I wouldn't need it. I couldn't turn the heater on because I needed the miles to get home. Luckily my daughter had fallen asleep in the back, and had her jacket, so she didn't notice the cold. Now I actually had a choice in the route. I could either take the freeway, which was a couple miles shorter but at higher speeds that would likely sap more of the little battery power I had left, or I could go through the town of Verona, which was a bit longer with more stoplights but had some stretches of 25 and 35mph roads. I decided to try Verona. It was actually dark enough by this point that I had to turn on the headlights, but happily they did not seem to impact the distance left on the battery much, if at all. Thank you, Nissan, for the LED headlights. It turns out that Verona was the right choice. I avoided a big hill on the beltline that I would have had to climb otherwise, and the stoplights didn't hurt too much at the lower city street speeds. I actually recovered 5 miles of estimated distance - which I would later learn is quite substantial when at the end of the battery's charge - and pulled into my garage with 10 miles left. Home, sweet home. Overall, that was quite an exciting and nerve-wracking experience. It probably wouldn't have been the worst thing in the world if I had run out of juice. I could have called AAA and gotten towed the last few miles, but boy, would that have been a hassle at the end of a long and trying day. It was good to end the adventure on a positive note, and I gladly turned the car off and plugged it in for the first time. That was my very first experience of owning a Leaf. Everything since then has been fairly uneventful in comparison, but I won't get ahead of myself. Next week I'll talk about what I thought of the car and all of its high-tech features as I broke it in and really got to know it better.